And you drive a Chthulhoid street racer straight out of space and time. Jockey for position on crowded, dangerous city streets. Jump the curb to race down the sidewalk, or cross the centreline and speed into oncoming traffic. Recruit Fin Diesel. Crank you Inaudible Amplifier. Rev up the Cycle of Self-Doubt. If you have what it takes, even gibbering madness won't keep you from the finish line. 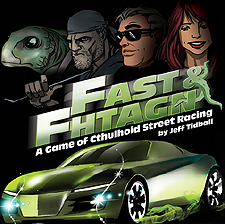 Fast and Fhtagn is a standalone game. It also works with Cthulhu 500 the card game of Cthulhoid track racing.